Hi all, I'm a newbie and tried to convert a 4:3 source video by setting the (display) aspect ratio to 16:9. The resultant video when played back does present itself as widescreen but unfortunately the actual image is incorrectly stretched. How would one go about converting the source video from 4:3 to 16:9 correctly? What programs would I need to do this without compromising the source video quality? Any feedback most welcomed, many thanks in advance. It's well-known to all that the aspect ratio of a video means the ratio between the width and height of the image and the most common ratio are 4:3 and 16:9. Imagine if your 4:3 video is used to playback on a widescreen display device with 16:9, what would happen? No doubt, the image would be distorted and significantly affects the visual effect of videos. So when you plan to convert your 4:3 video for widescreen playback, to change a 4:3 video to 16:9 is seemingly a priority for all. Case 1: Change Video from 4:3 Aspect Ratio to 16:9, Which Program Capable? 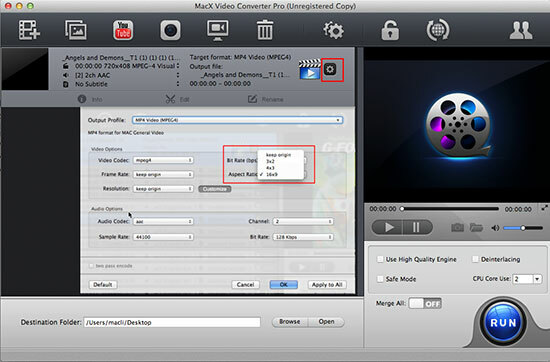 The far-famed MacX HD Video Converter Pro for Windows or (Mac version ) lives up to its reputation to convert among HD and SD videos like AVCHD, MTS, MKV, MP4, MOV, FLV, AVI, WMV, VOB, MPEG, etc. while allowing you to change video aspect ratio such as from 4:3 to 16:9, 3:2 to 16:9 and vice versa without sacrificing any resolution or quality. Unlike the iMovie 11 or handbrake, this app changes 4:3 to 16:9 to make video content fill the entire screen, rather than the black bars adding to. Thus, you can watch video on wide screen in the proper (16:9) format. Not only supporting you to convert a 4:3 video to 16:9 aspect ratio, it also aids you to adjust video resolutions, like convert 4K to 1080P, 1080P to 720P; improve frame rate, tweak 30p to 24p and boost audio to 320kbps/256/128, etc. Better still, it can transcode videos among SD and HD videos, incl. MP4 MOV AVI MKV FLV WMV 3GP, etc. and also provide you with 350+ preset profiles, like Apple iPhone iPad, Android Samsung Sony LG, Nokia, Huawei, Xiaomi, etc. How to Convert Aspect Ratio 4:3 Video Source to 16:9 for Widescreen Display? Free download this all-round video processing tool on Windows or Mac computer and then run it. Afterwards, import the 4:3 aspect ratio video file you want to convert by hitting the button at the top left corner. Here includes over 180 video and 14 audio formats for you to pick and you can also pick to directly encode video to iPhone X/8/7, iPad Pro/mini 4 Retina, Galaxy Note/S8 edge, HTC 10, Sony, LG G5 and more. Click on the wheel-shaped button on the right, and then choose 16:9 aspect ratio from the pop-up window. After selecting the place to store your output video file, press "RUN" to trigger the 4:3 video to 16:9 aspect ratio conversion on computer. On top of the above method to convert video from 4:3 to 16:9, you can also resort to iMovie 11, the world-renowned aspect ratio converter. How to adjust video aspect ratio in iMovie 11? Check below! 1. Fire your iMovie 11 up. Followed by the slight click to select a project in the Project Library. After that opt for File > Project Properties. 2. Time for make a decision from the Aspect Ratio pop-up menu. Of course, here you should choose the previous option, 16:9. Until now, the procedure of using iMovie to change 4:3 aspect ratio to 16:9 is done. You can try this solution if you have the only one need. Case 2: Convert DVD to 16:9 Aspect Ratio Video, Any Tool Recommend? Everyone knows that DVDs were originally made to comply with the NTSC or PAL broadcasting resolution, which is a non-square pixel standard using the resolution of 720 by 480 pixels or 720 by 576 pixels, stretched to accommodate either 4:3 or 16:9 content, never producing a true 16:9 resolution. But if you plan to digitize your DVDs for widescreen display playback, then you’re required to change DVD to 16:9 aspect ratio video in the first place. To convert DVD to 16:9 or 4:3 video, what you need is to seek assistance from a practical DVD ripping tool. 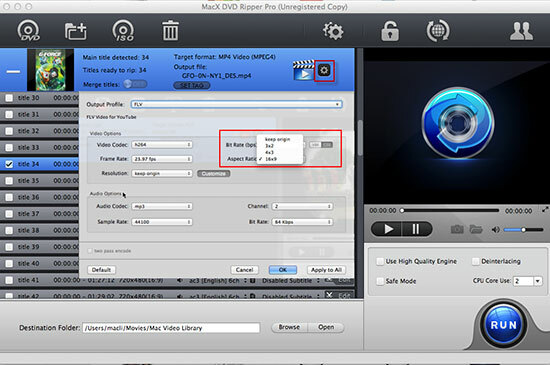 Here humbly recommends you the trustworthy MacX DVD Ripper Pro or (Windows version), which is capable for ripping any encrypted DVD to MP4, MOV, FLV, AVI, MKV while changing the DVD aspect ratio to 16:9 video as so to faultless playback on any widescreen display device such as Apple iPhone iPad, Android mobile phone and tablets with intact quality reserved due to its High Quality Engine supports. How to Change NTSC/PAL DVD to 16:9 for DVD Conversion? 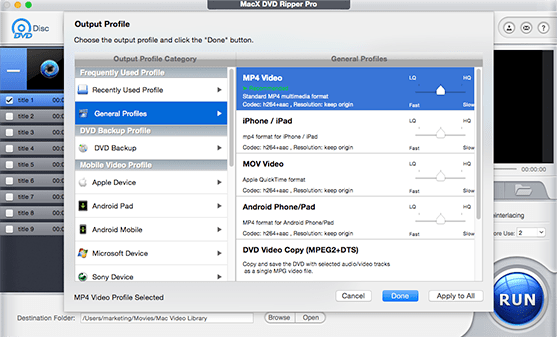 Regardless of backing up CSS-protected DVD movies, or Disney DRM DVD movies to 16:9, this all-conquering DVD ripping app can accomplish any task you throw at it easy as pie. Free Download DVD converting software on Mac or Windows PC (10) and fire it up, then import the DVD you want to rip by hitting "DVD Disc" button or "DVD Path" button. From the pop-up window, choose output video format you want. Generally, the MP4 format is the best bet since it keeps good balance between video quality and file size. Click on the wheel-shaped button on the right, and then choose 16:9 from the pop-up window. After hitting "Browse" button to choose destination folder, press "RUN" to start the perfect DVD to 16:9 aspect ratio video conversion on computer. Do you know the aspect ratio of your computer, tablets and smart phones? If no, show you a simple technique-use the greatest common measure to divide the resolution and then you will get it. Here I gather a list of the widely-used 16:9 video resolutions, which are divisible by 8 and ranges from the standard definition to high definition. Frame Rate Program - Change Frame Rate among 23.97, 29.97, 30fps etc. Video Quality Converter: Improve Video Quality through Resolution, Bitrate etc. 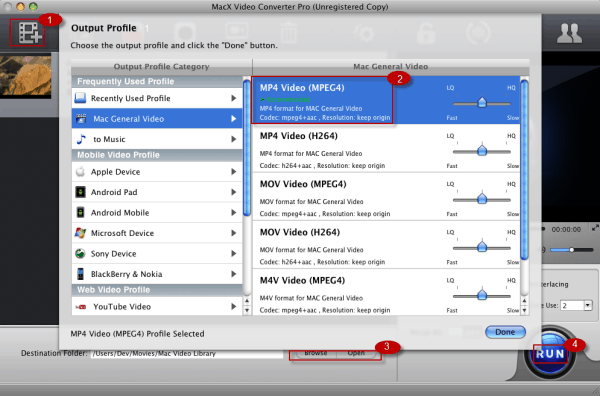 MacX Video Converter Pro excels in converting videos and converting video aspect ratio 4:3 to 16:9 or vice versa. Plus, it works perfectly in HD video downloading from YouTube, FB, etc. 1000+ video movie sites to iPhone iPad Android mobile devices in a flash.